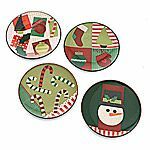 Show off your holiday spirit with pieces from these festive ceramic dinnerware patterns by Oneida. All patterns include pieces for your dinner table, for entertaining and for gift giving making them as useful as they are jovial. The Christmas Goodies pattern features bold red and green colors with images of classic holiday shapes. 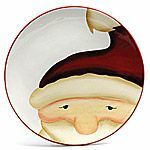 The Jolly Santa pattern, in rich red and cream, showcases a classic image of Santa Claus.